8/4/10 – Acquisitions – Barnard Castle, Bowes Museum – This is the first time we speak of the Bowes Museum, a Fine Arts establishment, located in Barnard Castle, Durham in the United Kingdom. It rarely makes acquisitions. 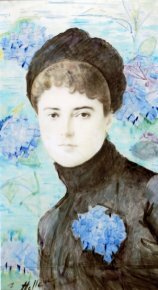 However, since the founding of La Tribune de l’Art, it added a beautiful work to its collection, in 2005, by Paul-Cesar Helleu, executed in collaboration with Theodore Deck on a ceramic plaque, Portrait of a Lady (ill. 1) and, in 2007 and 2008, a watercolour by Turner as well as a painting by Lucien Levy-Dhurmer. The canvas by Levy-Dhurmer (ill. 2) was purchased for £18.000 from Peter Nahum at the Leicester Galleries in London . This is an allegorical portrait of a famous actress from the Comedie Francaise, and a muse of Mallarme, Marguerite Moreno . The autumn figure, crowned with leaves and covered with a veil, evokes the soft and sfumato qualities of Leonardo’s portraits. The trees in the background symbolize the Sacred Wood dear to Puvis de Chavannes and, later, the Symbolists and the Nabis. The work dates from 1896, the year in which Dhurmer held his first personal exhibition at Georges Petit’s. His training as a ceramic artist (he worked from 1887 to 1895 at the Clement Massier factory where he became director) can be felt in his treatment of the background with gold-powdered shades imbuing the work with a metallic reflection, a common technique in the decorative arts at the end of the 19th century. 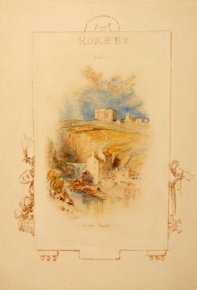 The Bowes Museum also acquired at Sotheby’s London a Turner watercolour in 2008, The Bowes Tower (ill. 3), for £30.500  (including charges). It represents a view of the Bowes castle, with its still familiar arch. This is one in a series of illustrations of a poem by Walter Scott which takes place in the Bowes countryside, Rokeby, and which Turner executed after 1830. With contributions from the MLA/V&A Purchase Grant Fund, The Art Fund and The Friends of Bowes Museum. 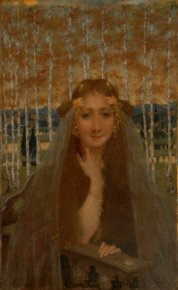 The title of the painting is The Autumn Bride. With contributions from the same institutions as in note 1.